Goldlink has been ordered to cancel all gigs until he's feeling better. 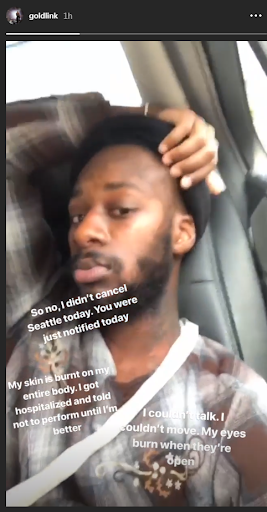 Goldlink just sent his fans into panic with news that he'd been hospitalized due some degree of burns across his entire body (he didn't specify to what degree). The announcement was made via Instagram on his StoryBoard one hour ago. By the looks of it, his injuries appear mild, commensurate with a first-degree burn. Goldlink inserted three paragraphs of text over a video of him showing off his wounds. A still from the video has been made available courtesy of Goldlink's Instagram. The very first paragraph addresses the cancellation of his show in Seattle at the Capitol Hill Block Party, a festival that will go as planned with or without Goldlink's participation. Other acts on the bill include Dillon Francis, Alvvays, Quinn XCII, Yaeji, Sol, Melvv, Kelly Lee Owens, Flasher and Dude York. The second paragraph mentions a brief hospital visit, as well as doctor's orders to not perform until he "felt better." Without alerting us to the cause, Goldlink describe the physical symptoms of his injuries, to the effect of burning eyes and an inability to move or speak. Godlink has tour dates lined up well into the 2nd week of August, and if he's to be taken at his doctor's word, some of those gigs will be renegotiated or altogether cancelled. If and when Goldlink chooses to reveal more about his accident, you'll be the first to know.